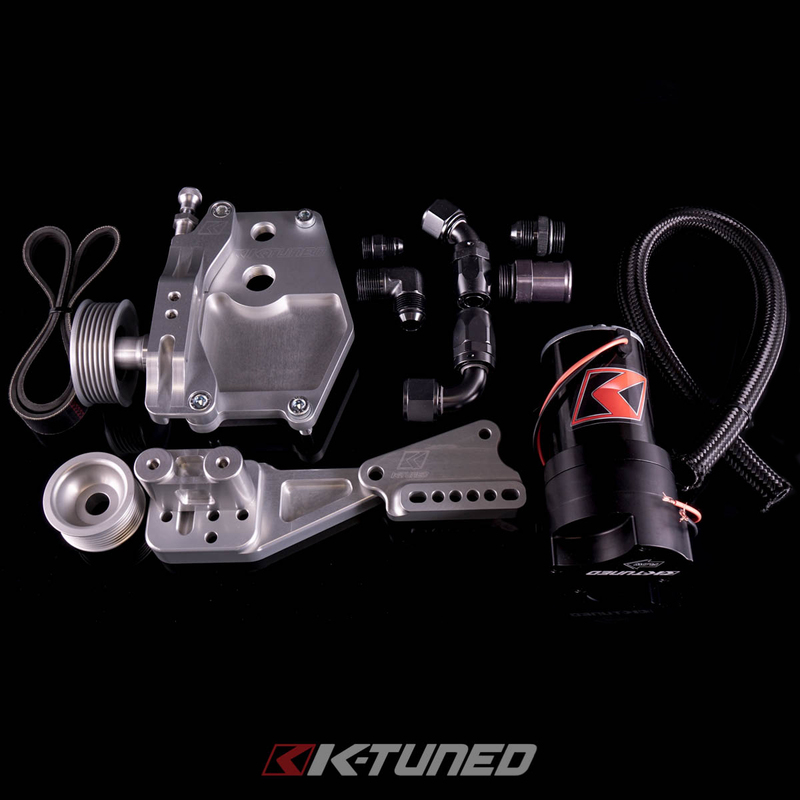 Back in 2006 we originally designed our K-Series Water Plate Kit that ran D/B Series alternator. We have revisited the project to breathe some new life into it. We constantly strive to improve and bring the very best to our customers and racers. The original design is still for sale today and that will not change. However, we have brought some nice new options with the ability to run a k-series alternator. 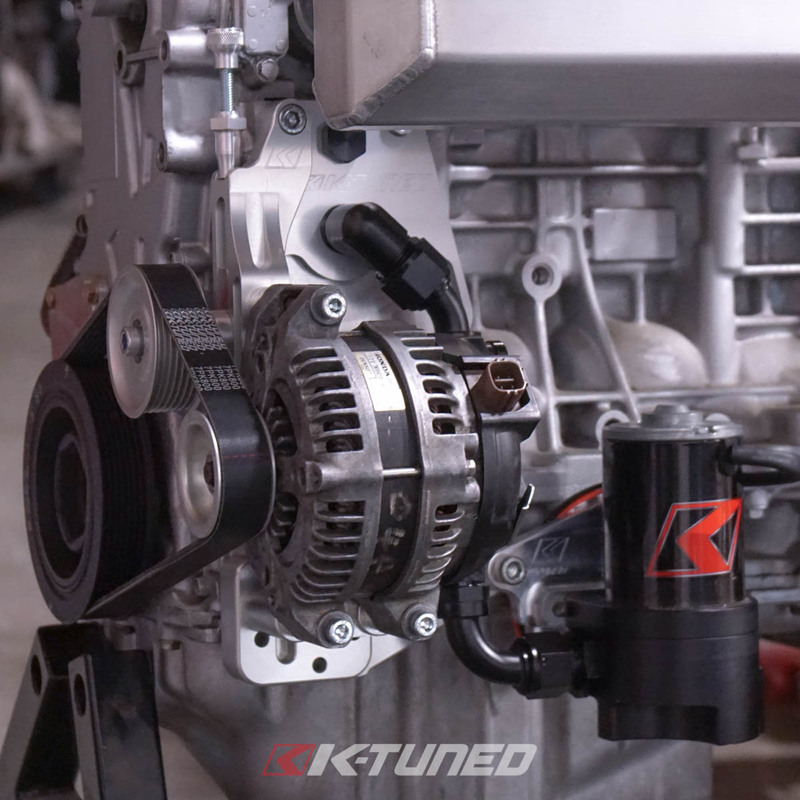 The new kit can be installed on your original K-Tuned Water Plate including original designs for those who want to upgrade to a k-series alternator. For several years now racers have used electric water pumps to reduce the power robbing effects of parasitic drag from their engines. The reason is pretty simple, by reducing the number of accessories the crank needs to turn there can be some noticable and impressive gains. 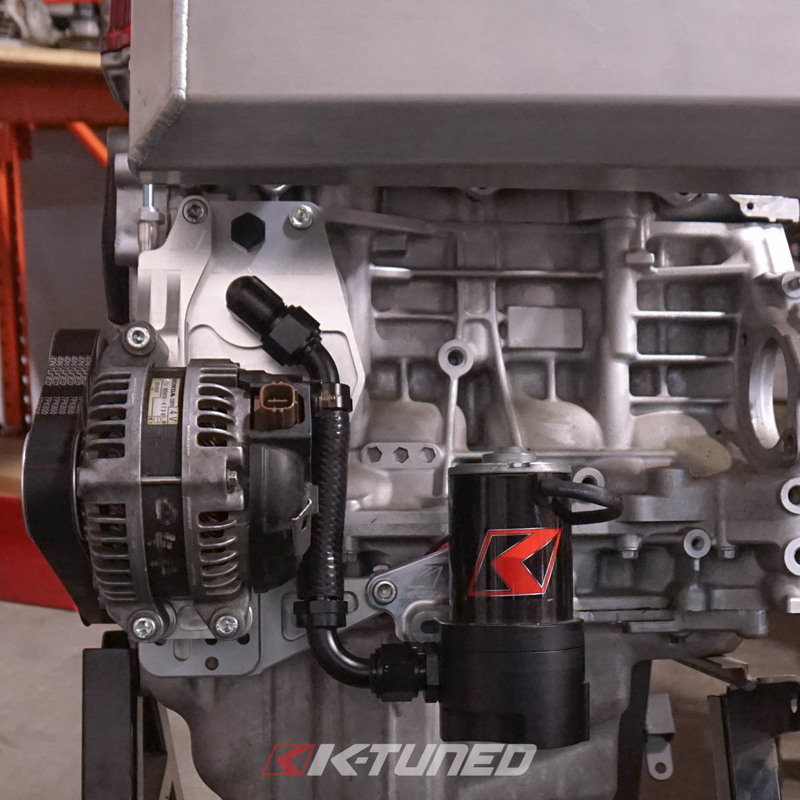 The K-Tuned Water Pump Block Off Plate system was designed to setup a K-series engine to use an electric water pump cooling system. It replaces all of the bulky and heavy OEM accessories with a simple lightweight aluminum plate. The original alt bracket setup was designed to hold the older and lighter B or D series alternator and works well. 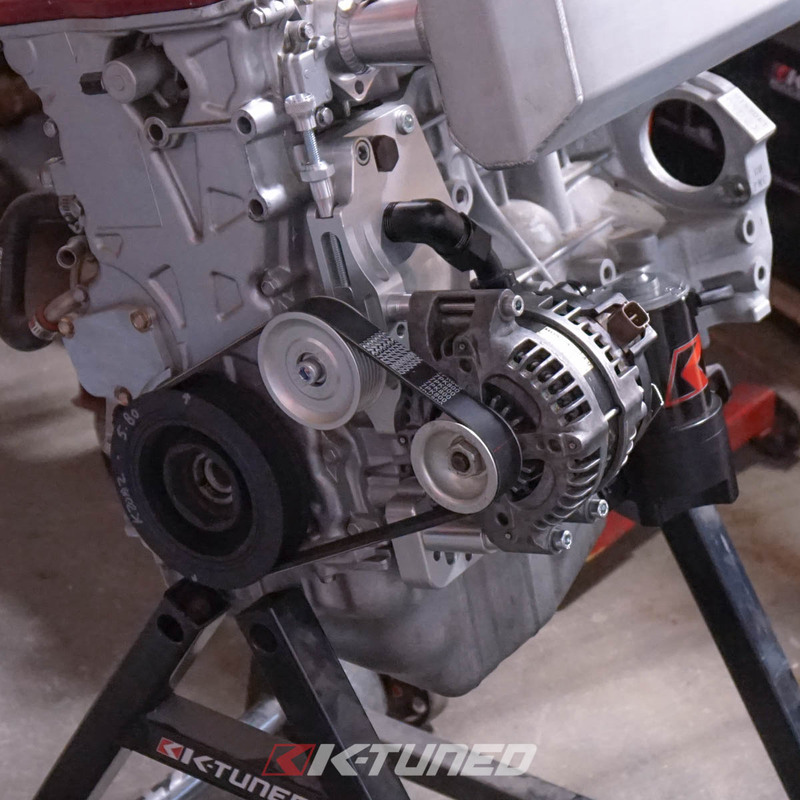 The only difference is a little extra work for installation, so we decided to design a compatible alternator bracket setup that works with the original oem K-Series alternator. This updated kit features a fully adjustable tensioner with an integrated pulley that mounts cleanly on the left side of our original Water Plate. 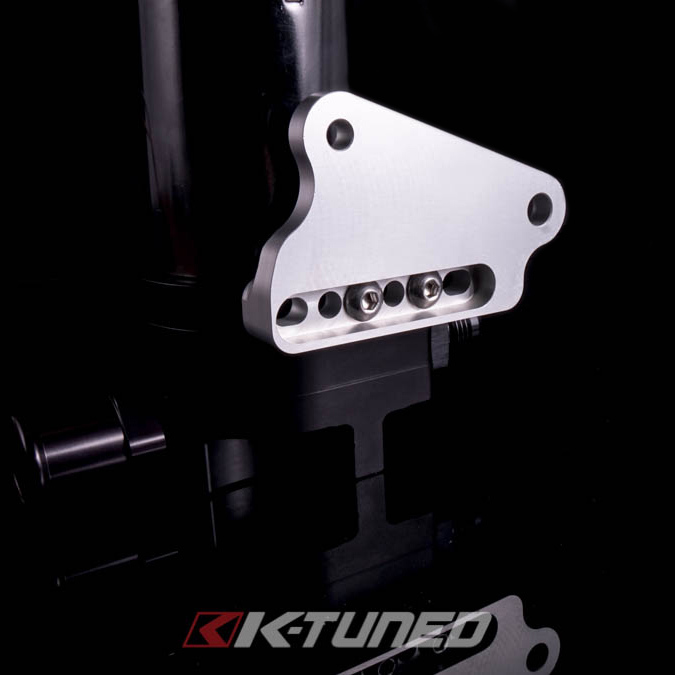 The lower alt bracket then easily bolts up to existing holes on most K20 and K24A engine blocks. The result is a setup that is much simpler to install, with no additional parts or wiring needed. 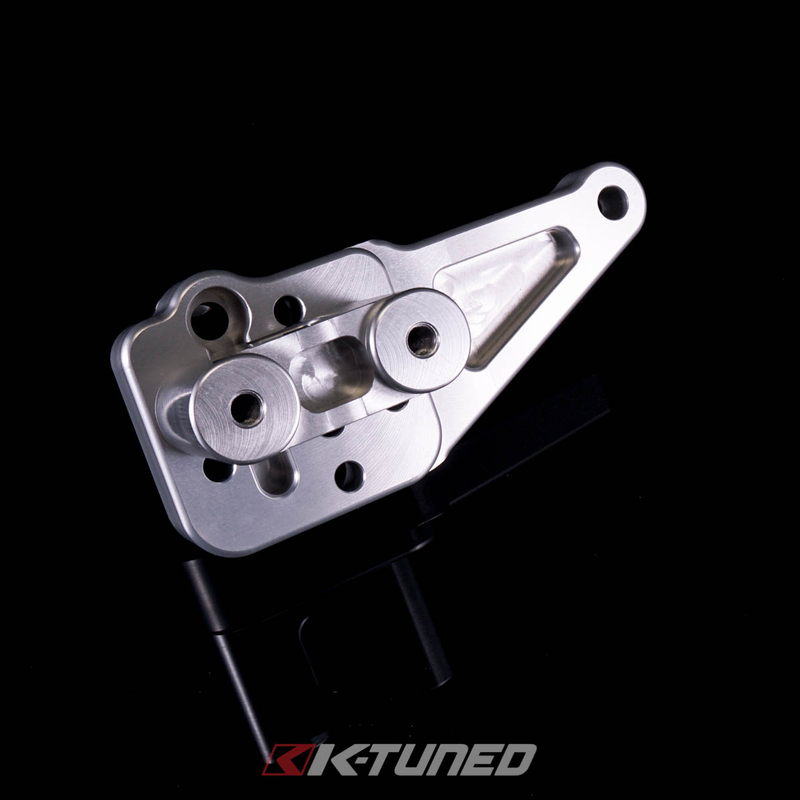 The tensioner and alt bracket are both made from CNC machined 6061 billet aluminum and are made extra thick to ensure that the alternator is held firmly in place. 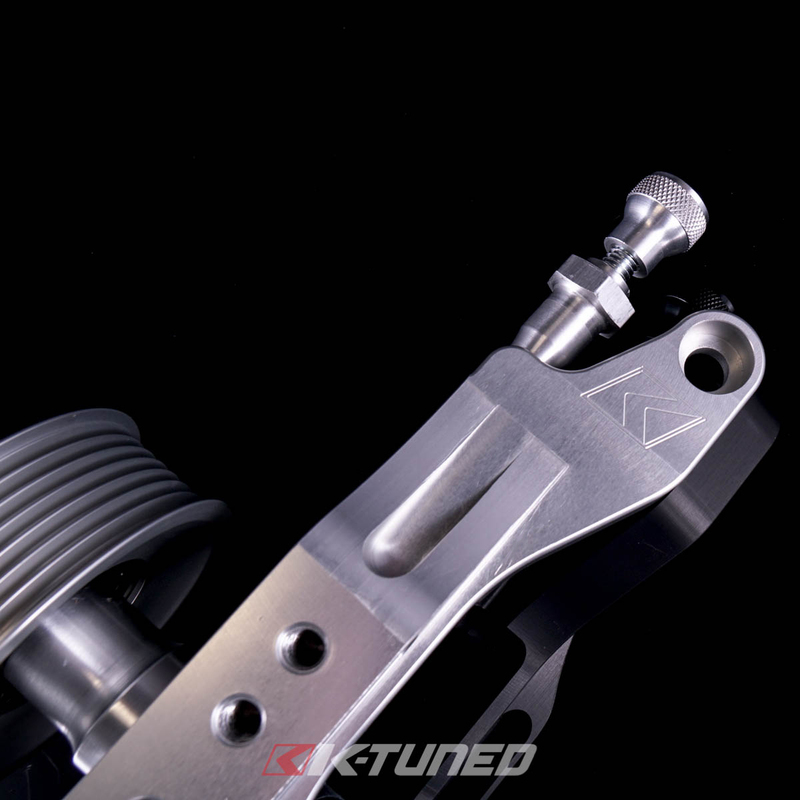 There are 2 mounting positions available to allow proper fitment with most stock crank pulleys. 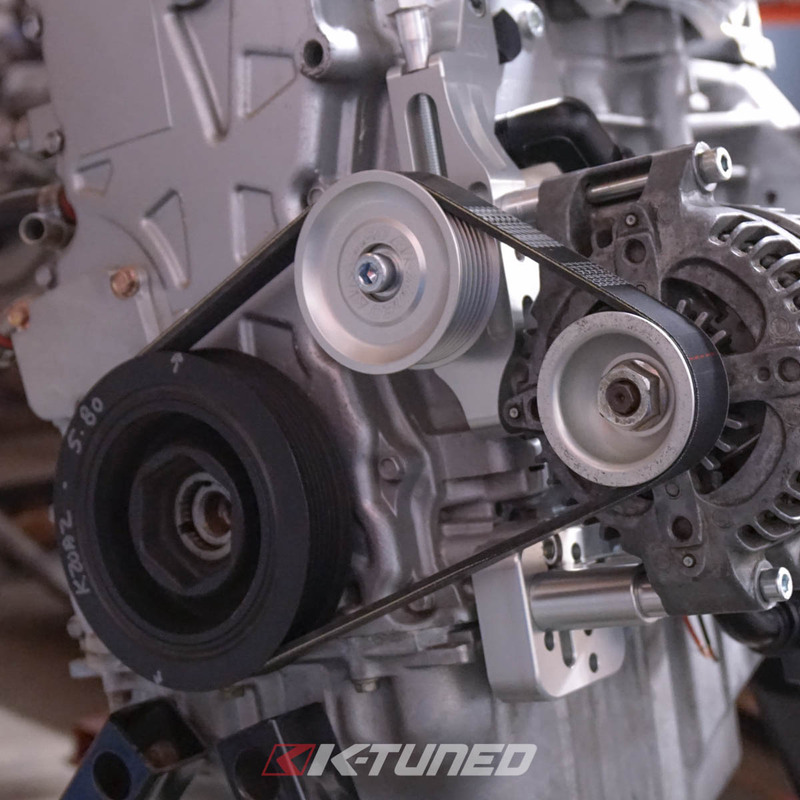 For the alternator, we made a lightweight billet alternator pulley to replace the heavy oem unit. We have also included a custom length 7-rib belt, that fits with most oem crank pulleys and all hardware for installation. 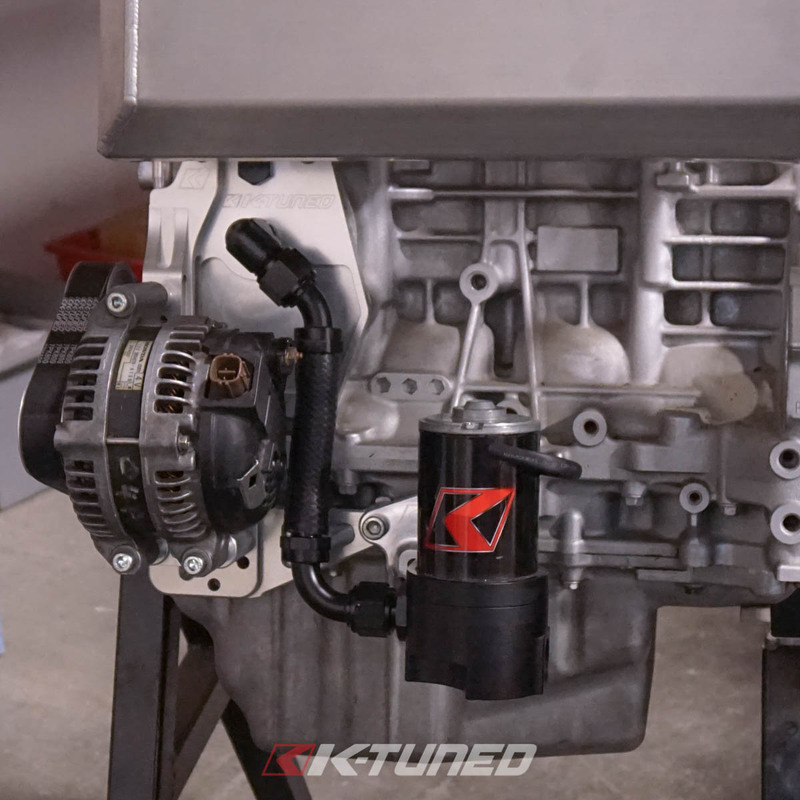 As a final bonus, check out our custom billet water pump bracket, it has been designed to hold our K-Tuned electric water pump right beside the plate setup. 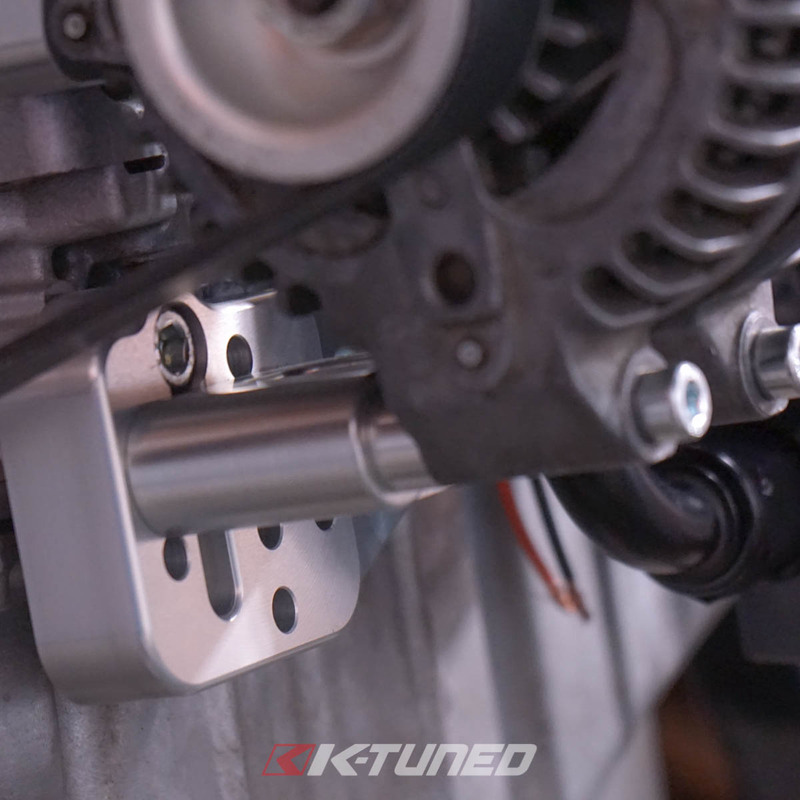 Just like the other brackets, this bolts up perfectly to existing holes on most K20 and K24A engine blocks. 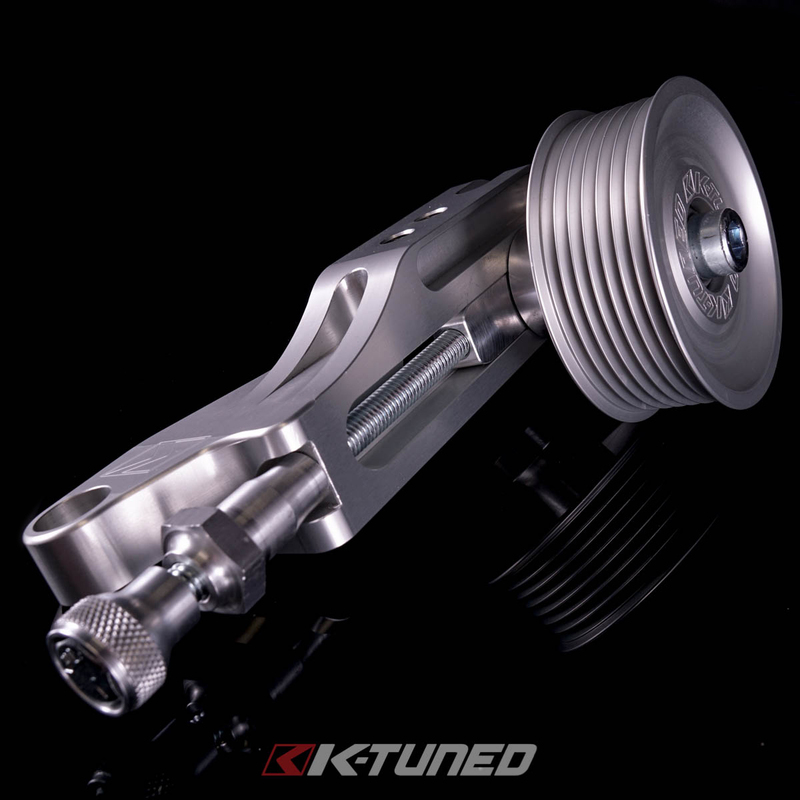 We can now confidently say that the K-Tuned Water Plate Kit is more complete than ever. 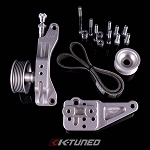 This kit is designed to use the crank pulley from a K20A Type R or Medium sized K20A2. If using a larger crank pulley you may need to use a longer belt (Dayco 4PK0825).